Who guards the north? Judging from the above photograph, possibly giant trees covered in snow and ice. The featured picture was taken a few winters ago in Finnish Lapland where weather can include sub-freezing temperatures and driving snow. Surreal landscapes sometimes result, where common trees become cloaked in white and so appear, to some, as watchful aliens. Far in the distance, behind this uncommon Earthly vista, is a more common sight — a Belt of Venus that divided a darkened from sunlit sky as the Sun rose behind the photographer. 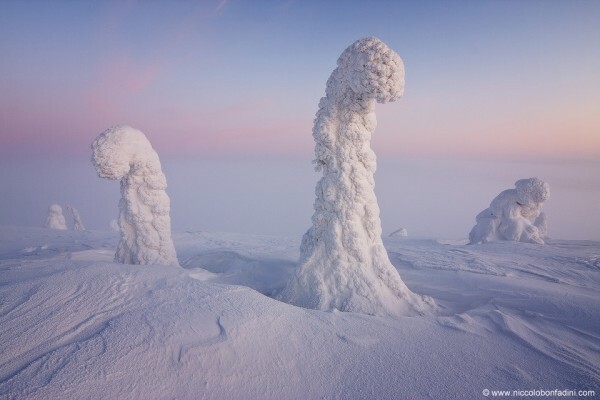 Of course, in the spring, the trees thaw and Lapland looks much different.